By special arrangement with the publisher (Cambridge University Press), the Mises Institute is very pleased to make available this hugely important work by the Israeli historian Martin van Creveld. The thesis is that the nation state as we've known it is a modern invention and a thorough failure, ever more costly and intrusive and unworkable. It is in the process of being supplanted by other institutions less formal and hence more functional to serve the member's goals. On the plus side, we see the emergence of a decentralized but global market order and the emergence of micro-political communities. On the negative side, there is the development of guerilla armies that act secretively and elude defeat in conventional military terms. The nation state, once the leviathan bestriding the global and ruling all before it, is being reduced in its size because it is being outsmarted and outrun. No longer can it command loyalty and no longer does it have a credible claim to be superior to its alternatives. In the course of his argument, the author sketches a complete history of the birth of the nation state, from the late medieval age to the modern era, and, as such, this treatise is an amazing accomplishment. It is interpretative history in the best sense. The author is not an Austrian or even a libertarian as such but rather one of the most distinguished living military historians. But he is alive to the issues that matter: the birth of the bureaucratic state, its rising place in the management of society, its catastrophic results in the 20th century, and its systematic decline in the 21st century. The book not only inspired an entire conference at the Mises Institute; it gave rise to a new genre of historical-theoretical literature that asks fundamental questions that should concern everyone interested in the status of liberty. Van Creveld covers economic, cultural, social, and military matters with impressive erudition. As one Amazon reviewer wrote: "Every once in a while you come across a book that goes beyond being interesting or thought-provoking, but is a veritable five lane intellectual super-highway. 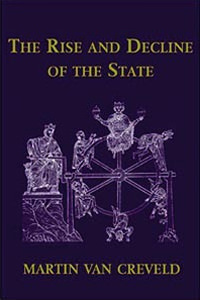 Martin van Creveld's The Rise and Decline of the State is such a book." David Gordon writes: "Are we doomed to sacrifice our lives to these Moloch states until civilization is destroyed? Van Creveld thinks not: he maintains that the state has now entered a period of decline. The horrors of full-scale nuclear war have deterred states from total conflict; and, with the demise of massive wars, the state has lost its raison d'être. Further, financial exigencies have almost everywhere mandated cutbacks in the welfare states.... Most readers, I suspect, will think our deliverance from the cancer of the state, if indeed van Creveld is right about this, grounds for rejoicing.... Mr. van Creveld's book displays great learning over many fields besides the author's specialty of military history." As an overview of critical matters concerning statism in European and American history in 500 years, this book has no contemporary equal.